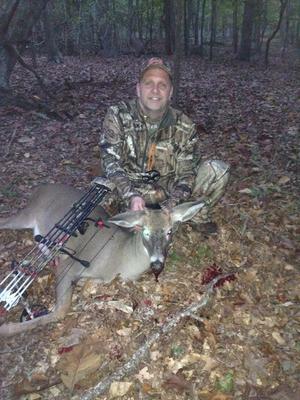 A friend of mine asked me to bowhunt whitetails in Suffolk County on Long Island on Friday, October 11, 2013. Before he finished asking I of course said, "Yes." I felt different heading into this hunt for some reason, I just knew I would fill my first ever bow tag, buck or doe. We reached our destination around 5 am, geared up, sprayed down with scent control spray and headed to our stand. As I sat in a double stand with Sal, and the hours ticked away and absolutly nothing came into view, I wasn't down or negative, I was just excited to be there. We exited our stand around 10 am, got a bite to eat, hung out and relaxed just waiting for the evenings hunt. We geared up again around 1:30 pm and split up about 200 yards apart in different stands. Nothing, until 3:30 pm when iI saw 2 does 60 yds directly in front of me. An hour ticked by, does outta sight now and a branch snapped to my left. As I looked to the sound, a spike was 25 yds browsing. As I watched and got ready, I saw legs walking directly behind him. A funky 3 point was coming in, and after 2 minutes of him browsing, he presented me with a 24 yard quartering away shot. I drew back my 60# PSE Stinger 3G , and sent my Easton Bloodline tipped with a Rage broadhead on its way. Whack!! 30 Yards later , the blood trail even a rookie like myself could follow, Sal says congratulations! The sweetest words I ever heard. This little 3 point is a trophy in my eyes, and I am so very proud. Thank so much to Sal for the invite, cant wait for next time.